(Philadelphia, PA) – The incidence of heart disease is on the rise, and new therapeutic strategies are needed. Approaches based on stem cells, which can potentially preserve or even regenerate heart muscle cells damaged by ischemia – a hallmark of heart disease – are especially promising. Now, thanks to an $11.6-Million Program Project Grant (PPG) from the National Heart, Lung, and Blood Institute (NHLBI) of the National Institutes of Health (NIH) under award number P01HL134608, scientists at the Lewis Katz School of Medicine at Temple University (LKSOM) are poised to explore new possibilities in stem cell-based treatments for heart repair and regeneration. The project is aimed specifically at better understanding the regenerative capabilities of stem cell-derived microvesicles known as exosomes. The Principal Investigator on the new award is Raj Kishore, PhD, Professor of Pharmacology and Medicine and Director of the Stem Cell Therapy Program in the Center for Translational Medicine at LKSOM. According to Dr. Kishore, exosomes offer an exciting opportunity to develop a cell-free approach to stem cell-based therapy for heart disease. "Previous attempts at stem cell therapy for heart disease did not work as hoped," Dr. Kishore said. "In many cases, the stem cells themselves were injured by inflammation in the heart following injection or were not functioning optimally, having been weakened from disease, such as diabetes, or age." Exosomes differ from stem cells in that they are not actually cells. Rather, they are tiny packages, roughly 50-150 nanometers in diameter, which are secreted by stem cells and taken up by neighboring tissue cells. They carry stem cell-specific small RNAs, proteins, and other cargo that mimic stem cell functions once released inside cells, giving them beneficial properties. "In heart cells, the cargo inside exosomes can carry out stem cell activities necessary for cardiac repair," Dr. Kishore explained. Many questions remain, however, about the function of stem cell-derived exosomes in the heart. It is unknown, for example, whether factors such as a patient's age or disease characteristics modify the ability of exosomes to repair or regenerate heart tissue. To answer those questions, Dr. Kishore and colleagues Walter Koch, PhD, the William Wikoff Smith Chair in Cardiovascular Medicine, Professor and Chair of the Department of Pharmacology, and Director of the Center for Translational Medicine at LKSOM, and Steven R. Houser, PhD, Senior Associate Dean for Research, Vera Goodfriend Professor of Cardiovascular Medicine, Chair of the Department of Physiology, and Director of the Cardiovascular Research Center at LKSOM, devised three collaborative projects. Each of the researchers leads a specific project as part of the new grant. 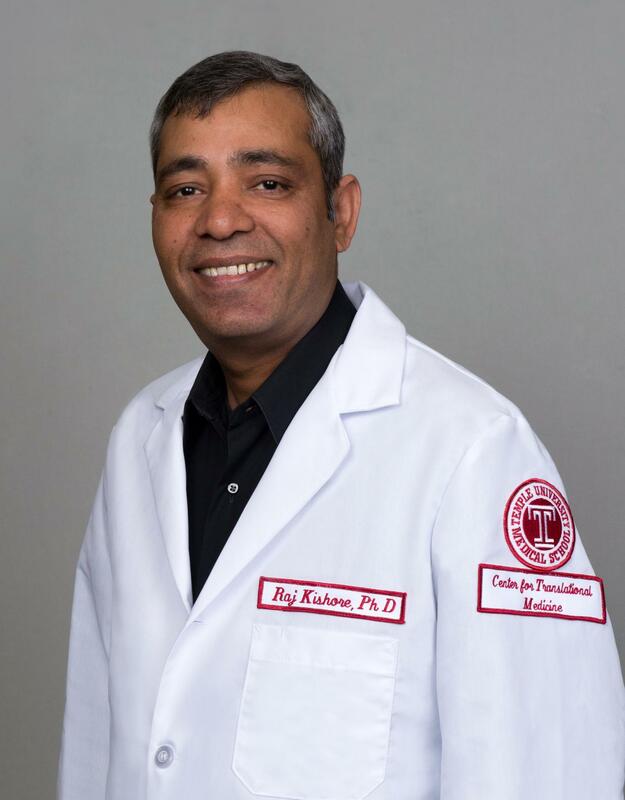 In Dr. Kishore's laboratory, work is focused on understanding the function and content of exosomes from bone marrow stem cells in healthy versus diabetic animals and animals with severe inflammation. "We want to know whether diabetes, which is common in heart disease patients, and inflammation from heart damage change exosome function or affect their cargo, and if so, what changes occur," he said. "Identifying specific disease-related alterations in exosome molecules will allow us to target and modify the molecules in ways that are beneficial therapeutically for the heart." Dr. Koch's team is examining signaling pathways in cardiac stem cells involving G-coupled receptor kinase-2 (GRK2). GRK2 inhibition potentially facilitates heart repair through mechanisms that involve alterations to the cargo of secreted exosomes. The third project explores exosomes from cortical bone stem cells, originally discovered in Dr. Houser's laboratory, and their role in heart repair. "This research gives us the opportunity to explore the idea that cell-based exosomes can be used to enhance repair of the heart after a heart attack," Dr. Houser explained. "Exosomes from cortical bone stem cells may contain factors that could reduce cardiac injury and enhance regeneration." The new award also funds two scientific cores supporting all 3 projects – an exosome isolation and characterization core directed by Dr. Kishore, and an animal surgery and physiology core led by John Elrod, PhD, Assistant Professor of Pharmacology at the Center for Translational Medicine at LKSOM. "This NIH Award is a testament to what we have built here at Temple," Dr. Koch said. "Dr. Kishore has shown great leadership in organizing this multi-component grant." The outcomes of the various projects are expected to have important impacts on the basic scientific understanding of exosomes in the heart and on clinical aspects of heart disease. "The goal will be to translate our findings into novel therapies for patients with heart disease," Dr. Houser added. Editor's Note: The content above is solely the responsibility of the authors and does not necessarily represent the official views of the National Institutes of Health.